This was the only outfit photo I took during the trip. Please just assume I was dressed to the nines the entire time (Ha!). I didn't even wear this the whole day, just put this on for dinner one night. 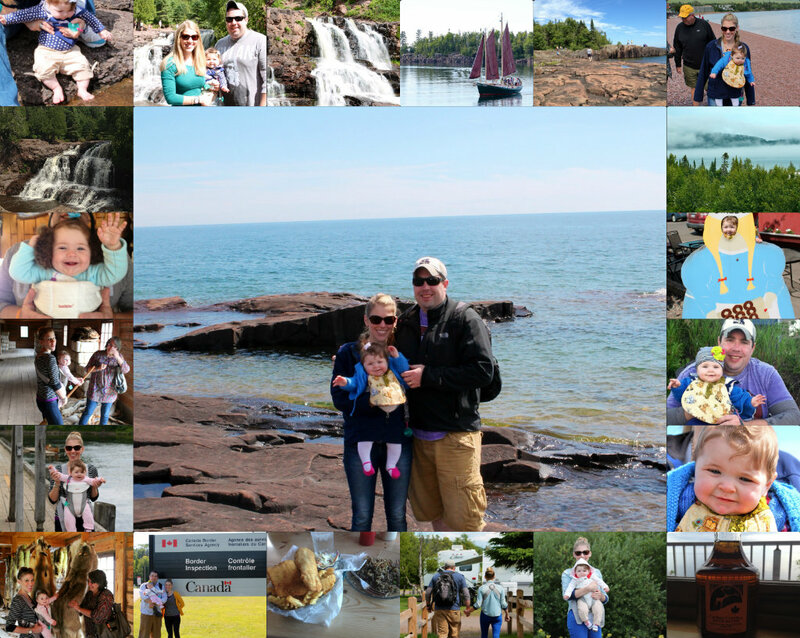 Here are some photos from our first vacation as a family! We stopped in Gooseberry Falls on our way to Grand Marais. Claire loved putting her feet in the water! The view from our condo was beautiful and the sound of waves was so relaxing. Claire got to experience her first bonfire and her first time in a swimming pool (indoor of course). We brought back the best maple syrup we've ever tasted and have thoroughly enjoyed breakfast night for dinner since. We also went to Canada one day to Fort William. Claire really liked to feel all the fur! You can see us flying on a trying out an old fashioned broom (yes Claire is grabbing on, too). We also loved taking walks along the beach and walking out to the point. I'm so glad we were able to go and I got to experience where Matt vacationed as a child. Hopefully we get to go back someday! i love grand marais!! and goosberry falls is so pretty! did you get to eat at sven and olie's? i love your dress, too...those boots are fabulous with it! We definitely ate at Sven and Olie's...twice! It was delicious! There are so many good restaurants around there! Thank you! It was a lot of fun! Now to cherish my last couple weeks at home before school starts! This looks amazing! Vacations are my favorite, for sure. And I really love your dress! Mmm... I love breakfast for dinner! It looks like you guys had a great trip - you guys are such a cute family! Thanks! I took full advantage of the cooler weather to layer! Thanks! Always sad to see them end though! Thanks! It was a great view to wake up to. We definitely enjoyed it while we were there! love the denim over your dress! Thank you so much, I am glad to hear that! Thank you so much! The sunsets were gorgeous there!